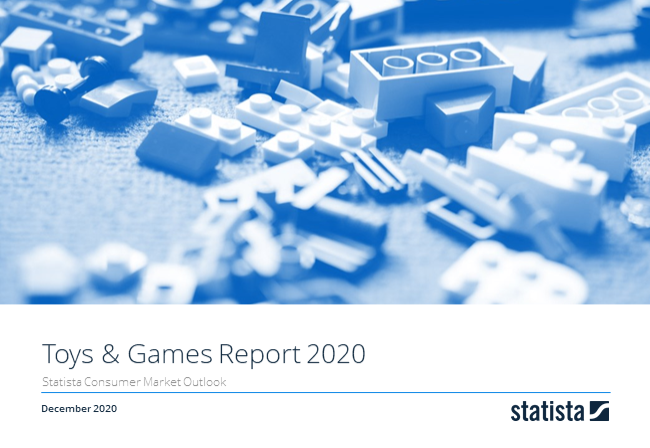 Revenue in the Toys & Games segment amounts to US$32,362m in 2019. The market is expected to grow annually by 0.5% (CAGR 2019-2023). In global comparison, most revenue is generated in China (US$60,497m in 2019). In relation to total population figures, per person revenues of US$98.34 are generated in 2019. The Toys and Games market is constituted by a wide variety of products intended mainly, but not exclusively, for the entertainment of children. The market focuses on traditional segments like dolls, construction sets as well as card games. Board games are excluded. Big brands in this category are Mattel, Lego, Hasbro, MGA Entertainment, etc. Reading Support Revenue in the Toys & Games segment amounts to US$32,362m in 2019. Reading Support The Toys & Games segment is expected to show a revenue growth of 0.4% in 2020. Reading Support The average revenue per person in the market for Toys & Games amounts to US$98.34 in 2019. Reading Support With a market volume of US$60,497m in 2019, most revenue is generated in China. Here you can find more studies and statistics about "Toys & Games".